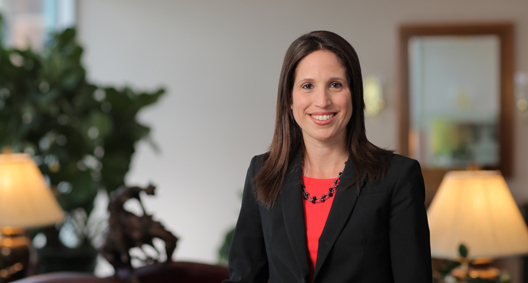 Julie Singer Brady concentrates her practice in complex commercial litigation, representing clients in matters concerning class action litigation, commercial foreclosures and actions on personal guaranties, claims concerning deceptive and unfair trade practices, and securities fraud, among others. The nature of her work varies with the current state of the economy, requiring that Julie quickly adapt and acclimate to different situations and types of cases. Julie is dedicated to resolving matters in the most effective and efficient manner possible. Served as the primary attorney managing numerous litigations on behalf of a bank and its non-bank successor-in-interest, which included large commercial foreclosures and actions on personal guaranties, resulting in judgments in the clients' favor totaling more than 100 million dollars. Served as trial counsel in the representation of an insurance company in defense of a class action alleging the overcharging of more than 250,000 property owners on premiums. Secured a ruling in favor of the client. Benefitted the client as well as sister companies that are facing similar class actions. Served as trial counsel defending various clients in class action litigations resulting in settlements of the claims against the clients. Served as lead trial counsel securing summary judgment on behalf of a condominium association in a litigation between the condominium association and unit owners concerning significant and unauthorized renovations; successfully defended the appeal of summary judgment. Served as trial counsel securing summary judgment on behalf of a real estate developer in a federal court action alleging claims of federal securities fraud by the developer in the marketing and sale of condominium units and claims of breach of contract, negligent misrepresentation, deceptive and unfair trade practices, false advertising, and violation of Florida's Interstate Land Sales Act (ILSA). Served as trial counsel in the representation of a real estate developer in numerous multiplaintiff actions in state court brought by condominium unit purchasers against the developer asserting claims of breach, fraud, deceptive and unfair trade practices, misrepresentation, and violation of ILSA. Served as lead counsel for a charity in successfully obtaining a writ of certiorari quashing a board of city commissioners' denial of a semi-public use permit for the operation of a social services center by the charitable organization.